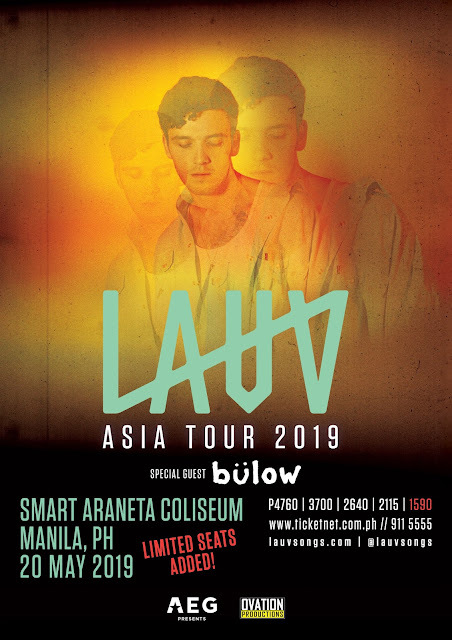 Lauv’s 2019 Asia Tour live in Manila and Cebu is presented AEG Presents and Ovation Productions. Ticket price for the new section at the Smart Araneta Coliseum is P1,590 and will go on sale March 25, 2019 10am via www.ticketnet.com.ph and TicketNet outlets. Ticket prices for the Cebu show at Waterfront Hotel are P3,700/ 3,170/ 2,640/ 2,115/ 1,590/ 795 available via www.smtickets.com and all SM Tickets outlets. For more info, call (02)911-5555 / (02)470-2222 or follow Ovation Productions online.